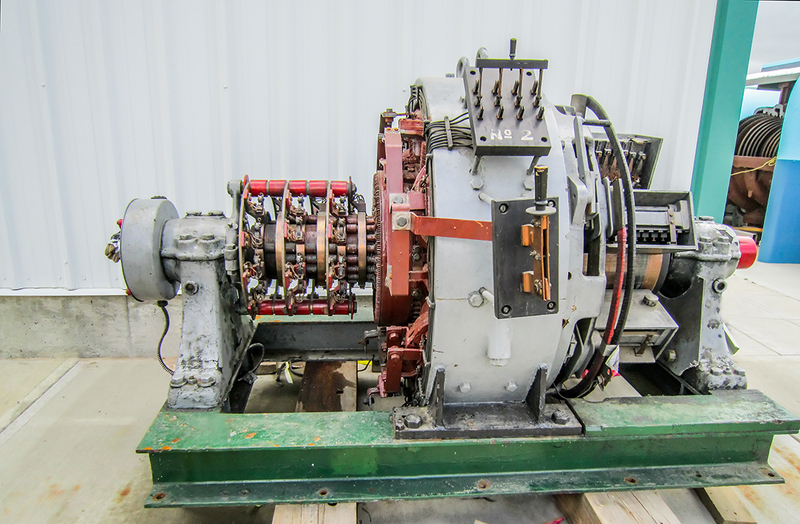 The Synchronous Converter was typically used to provide Direct Current (DC) for electrolysis in smelting, for traction motors in mine lifts and for street railway systems. The unit pictured had an Alternating Current (AC) input of 834 amps and a DC current output of 600 volts. This particular converter was used in the 1940s at Hudson Bay Mining and Smelting in Flin Flon, Manitoba. AC standardization at 60 cycles in North America allowed manufacturers to construct AC transformers designed to run rotary converters with DC outputs that powered the North American Industry DC infrastructure, including DC powered LRT and trolley bus systems. Synchronous converters became obsolete due to the invention of mercury arc rectifiers and solid state diodes. Synchronous converters had an advantage over earlier AC/DC conversions by motor-generator sets in that their windings were on a single armature. The disadvantage in using synchronous converters was that they required monitoring for start up and they also required regular maintenance.